The game might be marginal on a older computer. Mine is an Intel quad core i7, I wonder how it runs on an older machine? If we can minimize the amount of code execution time, processors can nap and that can save huge amounts of battery on a laptop computer or mobile phone. You can also get the same information from the Activity Monitor application. 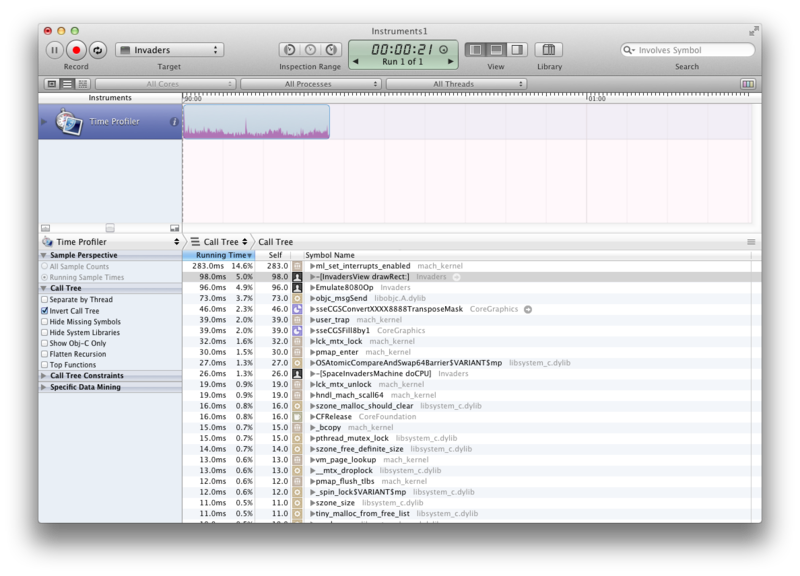 This is actually good, because ml_set_interrupts_enabled indicates that my app is mostly idle. So I've already got some idle time there. Instruments show that the time is split pretty easily between drawRect: and Emulate8080Op. If one dominated, it might show us what is the best bang for the buck. One other thing to point out is that sseCGSConvertXXXX8888TransposeMask is #5. If we disclose that, it shows that the time is spent in CGSConvertXBGR8888toRGBA8888. So I chose wrong for the bitmap format for core graphics. 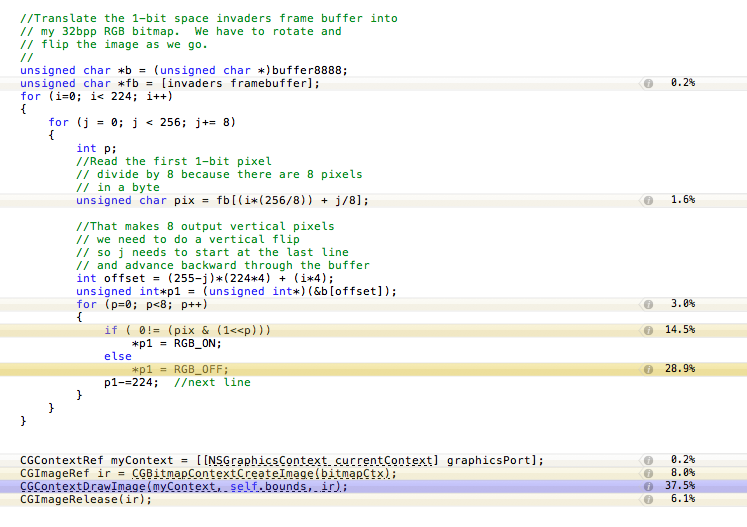 I could probably get rid of that time by changing the format of the CGBitmapRep that I create. It looks like the drawRect time is pretty evenly split between translating the bitmap to 32-bit color, and in CGContextDrawImage. (Note that these times are percentages of the time spent in this routine, not overall time.) It is possible that there might be some optimization available here. Maybe making a table of function pointers and breaking each opcode emulation into a separate function. disassemble $rip $rip+0x60 - Shows $60 bytes of instructions from the PC. What I discovered is that, the code starting at about Emulate8080Op+74 looks up an address in the table, then jumps to that address. That means it isn't doing the (up to) 255 comparisons for each opcode; the compiler has already done a table lookup. That means there is no optimization to be had by either of the things I mentioned earlier. This brings up a good point - I wrote this code in the easiest way possible and it would have been easy to make it complicated. The compiler fixed it all up for me. Compilers are really good these days. I could look at inlining the few routines I added to set flags and write memory, but the compiler may have done that for me too. I'll never know unless I look.